The region of the bleed is taken outside the trim size. In order to specify the same values vertically and horizontally, axf:bleed can be used. In order to specify individual values, axf:bleed-top, axf:bleed-bottom, axf:bleed-left, and axf:bleed-right can be used. When axf:bleed and others are specified simultaneously, individual axf:bleed-* properties take priority. These properties are not available with AH Formatter V6.3 Lite. Printer marks can be drawn in AH Formatter. With axf:crop-offset, specify a physical distance from the edge of a paper to the finishing position. With axf:bleed, specify the bleed region width for bleeding. 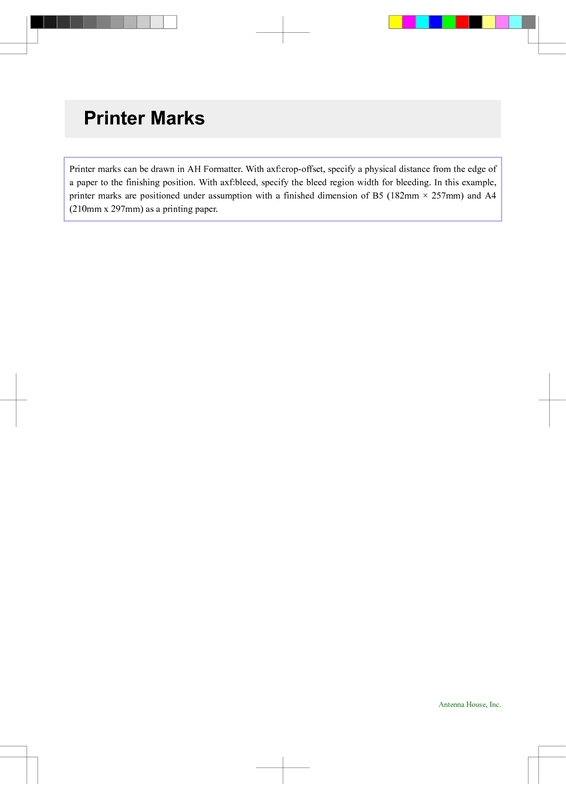 In this example, printer marks are positioned under assumption with a finished dimension of B5 (182mm × 257mm) and A4 (210mm x 297mm) as a printing paper.